A salad to make again and again, so many variations yet grounded by the terrific combination of crisp cucumber and soft avocado. Low Carb. Gluten Free. Vegetarian. A great choice for Meatless Monday! What're You Loving?Me, it's salads. Ask me what I'm hungry for? "Salad." Ask me what's for dinner? "Salad." Ask me to bring something to a potluck picnic? "Salad." Salad, salad, salad. And more salad. It's not a diet thing, it's just what tastes good. About April's Recipe CollectionApril's recipes ride the cusp of late winter and early spring. 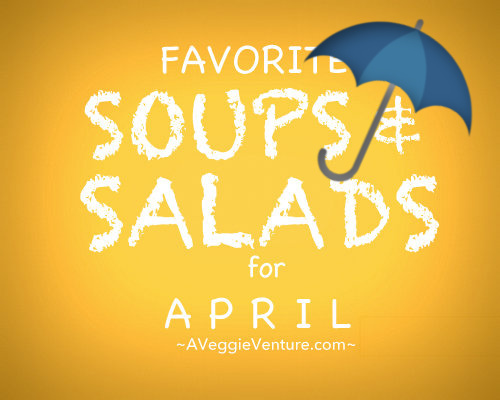 All but one of April's recipes are vegetarian and many are vegan. All but one call for easy-to-find ingredients — and even the "hard to find" ingredient, dandelion greens, might be as close as your back yard! And then? There are four salad dressings and a challenge, me to you, to "never buy salad dressing again"!